It’s been a pretty busy July where going to the cinema is concerned. 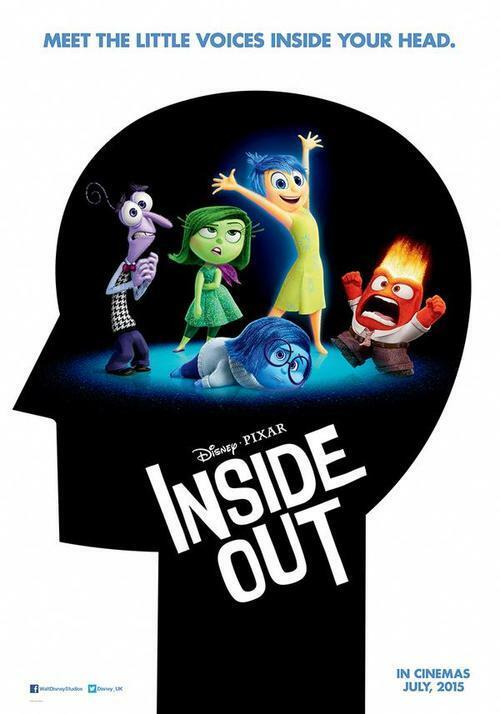 But today I finally rounded the month off with Pixar’s new film, Inside Out. I had quite high expectations of this one, given that it’s already been out in America for a while and it’s been getting very high praise. Besides that, the thought that the most enjoyable film I’ve seen so far this year was Cinderella has been making me a little self-conscious. Well, as of today, Disney is now occupying the top two spots on my list of 2015 films! The idea of little people living inside your body and conducting you through daily life is one that’s been done plenty of times before. The one I mostly think of is the Numbskulls from the Beano comic, but that was largely about senses and physical responses. Inside Out‘s characters are personified emotions – Joy, Sadness, Disgust, Anger and Fear – who run the brain of a girl named Riley. For all of Riley’s life, Joy has mostly been in control, but things change when Riley’s family moves from Minnesota to San Fransisco. Now that Riley is isolated in an unfamiliar new world, Sadness starts being compelled to take more of a role. When Joy tries to resist this, she and Sadness end up being catapulted into the outer reaches of Riley’s mind; now they must go on a quest to get back to headquarters and help Riley re-stabilise. I’ve already read quite a few reviews which analyse this film in depth (like my blogging friend Smilingldsgirl), because it’s pretty much impossible not to analyse it, so it’s going to be hard to say anything original. The first thing that comes to mind is something my dad kept saying after seeing the first feature-length Pixar film, Toy Story: “It’s wasted on kids.” Being even younger than Riley at the time, I didn’t really understand what he meant. Now I do, and his words apply even more to this film than they did to Toy Story. There’s a real genius at work here, creating a story with elements that will appeal to children, adults, and both at the same time – and integrating them perfectly. I really loved the design of Riley’s brain and how everything works: how the emotions operate a control panel to influence behaviour and create individual memories; the core memories which power the “Islands of Personality” that form Riley’s overall character; how daydreams, ideas and recalled memories work; and the mechanisms at work outside Headquarters, such as clearing out faded long-term memories that Riley no longer cares about. A lot of the “adult appeal” I mentioned really comes into play here, as the setting gets very detailed with incorporating different aspects of the mind, such as abstract thought, imagination and the subconscious, though these are also made understandable and entertaining for a younger audience. Another bit of genius is that this is all set in the mind of a girl who is not only undergoing a very significant event in her life, but is just making the transition from child to teenager. These mental processes are reflected in many different ways, such as various childish aspects of Riley’s Imagination Land getting demolished, and her Islands of Personality shutting down one by one. In a way, it’s a coming of age story, from a very different perspective than usual. In the setting of the film, the loss of Joy and Sadness is treated like a big disaster, with the other three emotions struggling to hold the fort as the mind literally falls apart – but on the outside, it’s just an ordinary girl who’s displaying perfectly typical behaviour for someone of her age in her situation. Could that be that in this universe, an internal crisis among the emotion people happens to most of us at some point and Riley is just the example we happen to be following? We are explicitly shown how emotions function inside other people’s heads – indeed, these are some of the funnier scenes in the film. I also really liked the form that Riley’s mind and memories end up taking by the end, reflecting the state she’s now in. The five emotions themselves are all great characters, all possessing dimensions and character traits beyond whatever they’re supposed to represent. The treatment of Sadness is particularly interesting. We’re mostly seeing things from Joy’s perspective through the film, and as she wants Riley to be happy as much as possible, she doesn’t want Sadness to have much influence. At the beginning, it’s difficult not to see things in the same way; after all, when we experience any story, we want the characters we empathise with to be happy. Sadness looks like she’s bumbling and being troublesome when she starts influencing Riley’s memories, but then, she hasn’t been allowed much practice up to this point. As the story progresses, in the “buddy movie” fashion we’ve seen in plenty of other films, both Joy and Sadness develop, with Joy in particular getting a better understanding of how her world needs to work. It all builds to a message about healthy emotional balance that won’t go over children’s heads, but is still very mature for such a film. I should also say what a downright beautiful film this is too, right from the lovely opening sequence where we see Riley – and her consciousness – being born. There’s some very nice quiet, artistic moments, such as Joy watching a memory of Riley skating, and dancing along with it. JOY: Okay, we’re waiting for it to load on the phone. Oh, the suspense is killing me! DISGUST: Sadness, Anger, you guys on standby? ANGER: (cracks knuckles) Oh, we’re not going to stop at moaning and teeth-grinding like when Preston lost to Colchester. This time, he’s gonna let loose! JOY: Wait…there it is…4-0 TO PRESTON! Inside Out pretty much hit my expectations spot on; definitely my favourite film of the year so far. It’s got something for everyone, which is exactly who I’d recommend it to. Rating: 4.5/5. This entry was posted in Film Reviews and tagged Disney, Inside Out, Pixar. Bookmark the permalink. Thanks for the shutout. It’s such an amazing movie. One that can be enjoyed on so many levels. I like that you wrote out your own scenario for your emotions. “Anger on standby” ha! You’re welcome. Regarding the post on your other blog about core memories, I’m probably able to think of some more having seen the end of the film. Nicely written, loved this film! Thank you – I loved it too! Thank you! Are you referring to cognitive behavioural therapy? I can see what you mean – the concepts behind it (as described on the NHS website) correspond well with what Riley goes through. Yes, go see it! Lovely review of the film. Out of interest, where did it drop half a star for you? For better or worse, I’m pretty unforgiving when it comes to ratings. There aren’t that many books or films I’ve given 5 out of 5 on this blog. For Inside Out, I think it was Bing Bong – he irritated me a bit, though he was still an OK character overall. Loved this film. Neat write up. Thank you. I was particularly happy with this review.